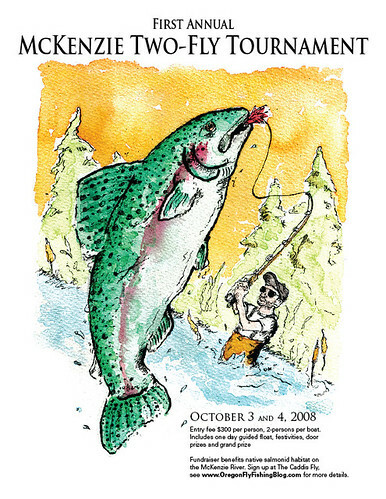 EUGENE, OR – The first annual McKenzie River Two-Fly Tournament will take place October 3-4, 2008 on the McKenzie River. Organized by The Caddis Fly Angling Shop and Trout Unlimited Chapter 678 (McKenzie River, Upper Willamette Chapter), proceeds from this inaugural event will fund restoration projects on the McKenzie River. The tournament organizers have partnered with the Eugene based McKenzie River Trust to allocate funds toward native salmonid habitat enhancement. The Trust is a local grassroots organization working to protect special lands in Lane and Douglas county Oregon for their fish and wildlife habitat, water quality and scenic values. The Trust has been recognized by its partners for being creative with its projects, professional in its work with landowners, and committed to the community. “The McKenzie River Trust welcomes the continued loyal support of anglers,” said Joe Moll, Executive Director. The tournament will take place October 3-4, 2008. Festivities begin Friday evening with a pre-tournament reception and raffle; the competition begins the following morning. The entry fee is $300 per person, two anglers per boat. Entry fee includes one day guided float trip on the McKenzie River, festivities, and door prizes. Rules, registration and further details will be announced at The Caddis Fly shop and www.OregonFlyFishingBlog.com. Visit TU’s blog or more information on Trout Unlimited in Oregon. This entry was posted in McKenzie River, Oregon Fly Fishing Clubs and Events. Bookmark the permalink.